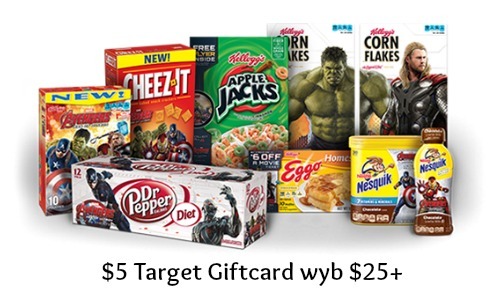 Starting 4/19 there is a great Target coupon where you can get a $5 Target Giftcard when you buy $25 or more of Dr. Pepper and Kellogg’s products! You can grab the in-ad coupon to get the deal. There is also a good chance a printable one will come up. This includes Kellogg’s cereals, Pop Tarts, Eggo waffles, Cheez-Its, Keebler cookies, Dr. Pepper drinks, Nesquik, and much more! Here are some coupons that you can pair with the store coupon.